The cosmic web -- the distribution of matter on the largest scales in the universe -- has usually been defined through the distribution of galaxies. Now, a new study by a team of astronomers from France, Israel and Hawaii demonstrates a novel approach. Instead of using galaxy positions, they mapped the motions of thousands of galaxies. Because galaxies are pulled toward gravitational attractors and move away from empty regions, these motions allowed the team to locate the denser matter in clusters and filaments and the absence of matter in regions called voids. Matter was distributed almost homogeneously in the very early universe, with only miniscule variations in density. Over the 14-billion-year history of the universe, gravity has been acting to pull matter together in some places and leave other places more and more empty. Today, the matter forms a network of knots and connecting filaments referred to as the cosmic web. Most of this matter is in a mysterious form, the so-called "dark matter." Galaxies have formed at the highest concentrations of matter and act as lighthouses illuminating the underlying cosmic structure. The newly defined cosmic velocity web defines the structure of the universe from velocity information alone. In those regions with abundant observations, the structure of the velocity web and the web inferred from the locations of the galaxy lighthouses are similar. This agreement provides strong confirmation of the fundamental idea that structure developed from the growth of initially tiny fluctuations through gravitational attraction. The cosmic velocity web analysis was led by Daniel Pomarede, Atomic Energy Center, France, with the collaboration of Helene Courtois at the University of Lyon, France; Yehuda Hoffman at the Hebrew University, Israel; and Brent Tully at the University of Hawai'i's Institute for Astronomy. "With the motions of the galaxies, we can infer where all of the mass is located: the galaxies and the 5 times more abundant transparent matter (usually wrongly called dark matter). This total gravitating mass, together with the expansion of the universe, is responsible for the motions that create the architecture of the universe. The gravity from galaxies alone cannot create this network we see," said Dr. Courtois. Dr. Tully adds, "Moreover, a wide swath of the universe is hidden behind the obscuring disk of our own Milky Way galaxy. Our reconstruction of structure with the velocity web is revealing for the first time filaments of matter that stretch all the way around the sky and are easily followed through these regions of obscuration." This definition of the cosmic velocity web was made possible by the large and coherent collection of galaxy distances and velocities in the Cosmicflows series. The current analysis is based on a study of 8,000 galaxies in the second release of Cosmicflows. The third release, with over twice as many galaxy distances and velocities is already available, and will reveal the cosmic velocity web in increasingly rich detail. The key element of the program is the acquisition of good distances to galaxies. Several methods are used, such as exploiting the known luminosities of old stars that are just beginning to burn Helium in their cores, and the relationship between the rotation speed of galaxies and the number of stars they possess. The observations have involved dozens of telescopes around the world and in space and at wavelengths from visible light through the infrared to radio. "The velocity web method for mapping the cosmos is analogous to using plate tectonics in geology. It helps understand not just the current layout of the universe, but also the movement of the invisible underlying masses responsible for that topology," said Dr. Courtois. The team has produced an extensive video demonstrating the cosmic velocity web. It first explains the concepts underlying the cosmic velocity web reconstruction, followed by a description of its major elements. 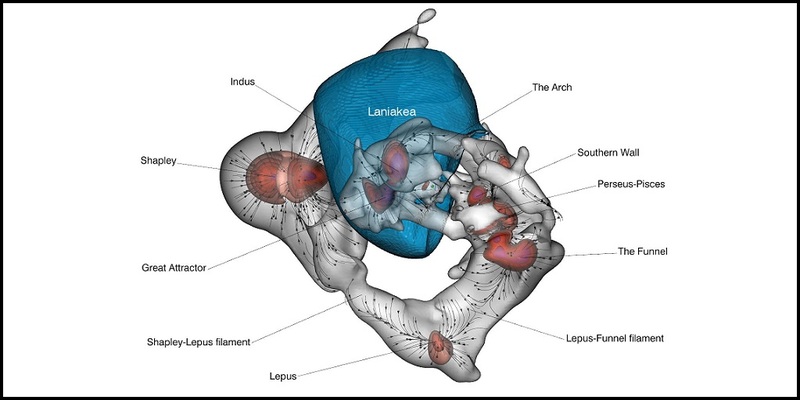 The video then shows how cosmic flows are organized within its structure, and how the basin of attraction of the recently mapped Laniakea Supercluster resides within its elements. In the final sequence, the viewer enters an immersive exploration of the filamentary structure of the local universe, navigating inside the filaments and visiting the major nodes such as the Great Attractor. The 11-minute video is linked below and available at https://vimeo.com/pomarede/vweb. The 3-dimensional map can also be explored in an interactive visualization, using the free online Sketchfab platform. This is a powerful tool to visualize interactively the structure from any viewpoint and compare it with the distribution of galaxies; one can dive inside the filaments and explore them in immersion. With appropriate virtual reality hardware, it can also be used in VR mode. This visualization marks a milestone as the first time such an interactive dataset will be embedded in the online version of the scientific article appearing in the Astrophysical Journal. Everyone is invited to interact with the data below, or at https://skfb.ly/667Jr. The team of researchers includes Yehuda Hoffman, Hebrew University's Racah Institute of Physics, Daniel Pomarède, Institut de Recherche sur les Lois Fondamentales de l'Univers, CEA, Université Paris-Saclay, Gif-sur-Yvette, France; R. Brent Tully, Institute for Astronomy (IfA), University of Hawaii, USA; and Hélène M. Courtois, University of Lyon 1, France. The work appears in the August 10, 2017 issue of the Astrophysical Journal and can be found online here.